At one time or another, nearly everyone has been told that they have bad breath. Sadly, there are probably hundreds of more times that you’ve had bad breath and no one had the nerve to tell you. There are quite a number of reasons that you can have bad breath, some related to the foods you’ve just eaten, and other times it’s bad bacteria in your teeth, gums, or on the surface of your tongue. To remedy the situation, you’ll need to do some investigating to get to the root cause and then take action. Here are some tips to get you started. No matter how old you are, you should be brushing your teeth at least twice per day according to dentists. This serves the purpose of eliminating residual food deposits on and around the teeth which can be a source of bad breath especially if left to rot. Brushing also helps prevent the decay of the teeth, which creates a permanent bad smell, and prevents gum disease. Gum disease has its own smell, not that of rotten food, but of rotting flesh. It’s unmistakable, but you should have your dentist give you a full exam and identify all of the potential causes of bad breath. Your dentist can fix and repair most of the problems, but brushing your teeth regularly is imperative to keeping your mouth clean and odor-free. There are a lot of different foods that can cause or just contribute to bad breath and some of them can be a constant problem. Cigarette smoking, especially long-term, will permanently give your mouth a burnt smell of tobacco that’s really hard to get rid of. Even if you quit smoking, that smell will persist for awhile. You can get a thorough dental teeth cleaning and scrub your teeth daily plus mouthwash to hurry up the process, but smoke sticks and is hard to remove. Coffee can also give a person bad breath, it’s not as strong as smoke and can usually be scrubbed out by brushing twice and using mouthwash. It will also taint your breath all the way down to the stomach so it won’t completely go away for about a day after you quit drinking coffee. There are lots of other digestive issues like onions, garlic, hot peppers, and high-protein foods that can leave a lingering smell, but that should go away after a few hours. Everyone’s tongue has a rather rough surface that’s designed to help you swallow food down the throat without issues. It’s also to help you eat and drink foods and beverages safely without choking. However, those same ridges also can trap all kinds of food, bacteria, scents from spices, fungi, and even dead skin cells from the tongue. All of this debris adds together to make a rancid smell. In the past, many people used to tell you to brush your tongue at the same time that you brushed your teeth if you were having problems with bad breath. Now, there are special tools called tongue scrapers that can make the task much easier and more efficient. 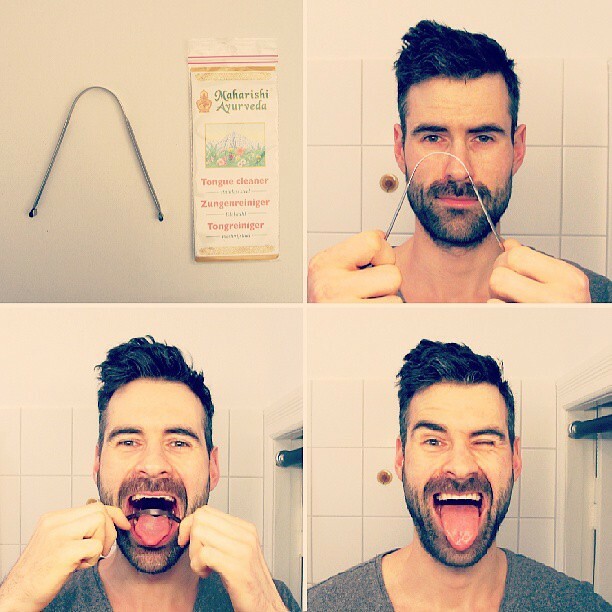 You can buy these tongue scrapers online and some drug stores also carry them as well. Dental researchers have determined that scraping your tongue is far more efficient at cleaning it than brushing it. A proper scraper should have a curved cleaning edge to get the most debris and bacteria off with each pass. Plus, the scraper should be easy to hold, possibly using both hands, gentle to the tongue, and not cause any pain. Reading the online reviews is an excellent education on just how effective these tools are. You’ll read people exclaim that they had no idea how much gunk was residing on their tongue and how the wished they had found tongue scrapers sooner. Some people have even lost a large portion of their sense of taste because they have so much bacteria, toxins, and other junk on their tongues. This gunk can be a primary cause of bad breath, stomach upset, and lead to infections of the throat as well. It’s also a good idea to use mouthwash to ensure clean tongue and gums. Tongue scrapers will most likely become a standard daily part of most people’s dental care. They are easy to use, safe for your tongue, and contribute to an overall cleanliness that most people have missed for years. People experience enhanced taste, less bad odors, a better feel with less slime, and lots of other benefits. They aren’t expensive and you’ll be amazed at how well they work. If you’re like millions of others around the world, then you probably use mouthwash or you’re thinking of using mouthwash. However, is mouthwash actually good for you? If you want to find out the answer to this question, then continue to read the rest of this article. There are quite a few issues that are associated with conventional mouthwash. One of them is that your oral microbiome can become harmed. If you’re not careful, then mouthwash can completely destroy good bacteria, on top of the bad bacteria. Another issue with most mouthwashes is that they can dry your mouth out. You produce saliva naturally, and mouthwash can disrupt that production. In turn, you could end up with dry mouth that is hard to get rid of. It’s also worth pointing out that some people believe that mouthwash may put you at risk of developing cavities. One of the reason for this is that the good bacteria in your mouth can be killed off, as previously mentioned. Not all mouthwash will put you at a high risk of cavities, but there are many that will increase your risk. Although more research needs to be done, some believe that the use of mouthwash is linked to an increased risk of oral cancer. It appears that products that contain alcohol are the ones that may potentially increase your risk of oral cancer. This is why you need to be careful if you decide to use mouthwash. There are many benefits of using mouthwash, with one of them being that it may help you cut down on cavities. Many mouthwashes contain fluoride. This has been studied and shown that it can help reduce the chances of developing cavities. Another benefit is it can help fight off gum disease. Tooth sockets and gums can become inflamed due to bacteria building up, which can lead to plaque. If you want to prevent periodontal disease, then you should consider using an antibacterial mouthwash. A third benefit of using mouthwash is that it might help with canker sores. Bacteria can lead to canker sores becoming more painful. Using mouthwash can reduce bacteria, and in turn this may reduce the pain that canker sores can cause. Your breathe will become fresher. Do bear in mind that the actual results you get with mouthwash depends on factors such as the type of mouthwash you use and how often you use it. Generally speaking, your breath will be fresher and smell better. Alcohol is an ingredient that you should keep an eye out for when choosing a mouthwash. Alcohol can cause a lot of issues, with one of them being dry mouth and ultimately leading to bad breath. Before you purchase mouthwash, check to see how much alcohol is in it because the average conventional mouthwash can contain around 25% alcohol. This is actually a lot, so it’s best to avoid mouthwash that has that much or any alcohol at all. Chlorine dioxide is another ingredient to avoid. The CDC actually describes this ingredient as being a hazardous gas, and it’s actually a bleaching agent. This is why it is found in many mouthwashes that claim to make your teeth whiter. Parabens can be found in many products, and to different degrees. It’s best to avoid any mouthwash with parabens in them. The same goes for products that contain poloxamer 407. First, natural mouthwashes are just that, products that contain natural ingredients. The ingredients you typically find in commercial products will not be found in mouthwashes that are truly all-natural. This means they won’t have the previously discussed ingredients. Also, you should be aware that natural mouthwash will not do the same things that the mainstream brands claim to do. This means all-natural mouthwashes won’t whiten your teeth, nor will they leave you with long-lasting fresh breathe. However, there are many benefits of using natural mouthwash. One of them is being that they don’t contain alcohol and they are ideal to use if you have sensitive teeth. Another benefit is that natural mouthwash doesn’t contain fluoride. As previously discussed, fluoride is not good for you and has been linked to a number of health issues. If you don’t want to consume fluoride, but you want to use mouthwash, then make sure you choose an all-natural one. It’s important to note that not all natural mouthwashes are created equal, therefore it’s important to choose one after you have done your researched. As a general rule of thumb, you want to compare several natural products and research any ingredients you don’t recognized, as you want to be sure you are going to be using a truly all-natural mouthwash. After you have compared mouthwashes and have read reviews, you can decide which one to buy. Is Mouthwash Good For You? Generally speaking, conventional mouthwash really isn’t that good for you because it can dry out your mouth and skin, as well as kill off good bacteria. It can even cause your breath to smell bad and some mouthwashes may lead to mouth ulcers and your risk of oral cancer may increase. If you want to avoid the potential negative effects of conventional mouthwash, then you should use an all-natural one or create one via a DIY mixture. Generally speaking, if you don’t decide to use an all-natural mouthwash, then make sure you choose one that doesn’t contain high amounts of harsh ingredients. Use the mouthwash in moderation, which means maybe just a small amount once per day or twice per day. Before you buy any kind of mouthwash, you’ll want to read reviews on it and check the ingredients. As you can see, it is all about choosing and using the right kind of mouthwash. As long as you choose a high quality mouthwash that doesn’t contain certain ingredients, then you should be fine. Make sure to weigh the pros and cons of mouthwash before deciding to use it or not. We are just getting started. We aim to be a resource for folks on the best tip and tricks on how to keep your mouth and teeth, health and clean. We have been in the dental industry for quite some time. We have seen it all. We want to use our experience to give you the best information on how to have the best dental experiences. Please check back as we are in the building phase and don’t have much to show. Yet. Like I said, give us some time and we will have some great information for you.